The march of time is inexorable. No matter how much you watch what you eat, exercise, and generally try to take care of yourself, you’ll obviously still age. 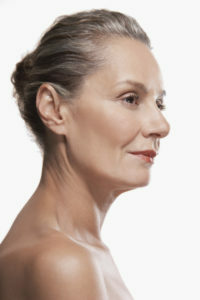 Fortunately, the signs of aging, while unstoppable, can be delayed or their appearance lessened. Here are the three signs of aging that usually prompt people to consider getting some help from Dr. Jones. Skin laxity — Gravity never stops pulling downward. As you age, your skin is particularly susceptible to its forces. Also, facial muscles tend to weaken with age. The result is droopy eyelids and jowls. Volume loss — As collagen and elastin (the two proteins in the body responsible for skin support) production decreases with age the result can be volume loss in areas on the face. The areas under the eyes and below the cheekbones both become hollow with volume loss. Changes in skin tone and texture — Where the skin was taut, plump, and smooth, as we age it becomes dull, dry, and leathery. This is usually the result of reduced collagen production combined with sun exposure. Volume loss and changes in skin tone and texture can all be addressed non-surgically. Injectables (Botox and dermal fillers), chemical peels, and laser resurfacing treatments all work to improve these issues. Skin laxity, especially if more extreme, can best be addressed with surgery, either a facelift, brow lift, or eyelid surgery. Dr. Jones believes that steps to slow down the aging process should also look beyond just the face and should include the neck, chest, décolleté, and hands. These areas are often overlooked. So, don’t put up with these signs of aging! Give us a call at 405.418.5400and let’s discuss your options. Before Getting a Botox Injection, Ask Yourself These Questions! Does Everyone Ask You If You’re Tired? Maybe You Need a Browlift.